Get over your fears and anxieties by getting the know-how you need. You have an idea or a concept but going from where you are now (point A) to being an independent business owner (point Z) still seems like a tremendous task. You've read books, articles, listened to the experts and taken courses only to find yourself overwhelmed. The truth is you don’t know the real “Game” of business, what operates behind the scenes. 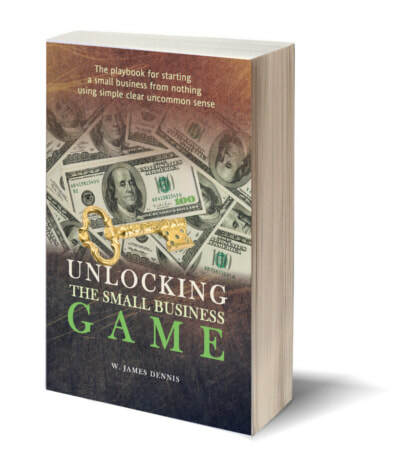 By reading, Unlocking the Small Business Game, you soon will. A true Hustler is not a con-man. The CEOs of the business world hustle everyday. A Hustler knows how and when to take advantage of every opportunity (or create their own) and move forward in such a way that they are eventually guaranteed success. This book is the truth about the Game; are you prepared to play? The principles and techniques in this book can be applied to starting a home based or small business, a network marketing affiliation or even just a side hustle - it's that easy! Everything is very easy to understand and follow... He doesn't just tell you it can get done but also shows how to do certain things in your biz. Big props for Unlocking the Small Business Game! I've always thought over the possibilities of merging business with the format of "The Game for years. The author did an excellent job in making that happen in a method that provides concepts from streets a way to legitimacy view business, and a way for those not familiar with the streets to legitimately view " hustling" in its authentic form! Excellent piece of work! It's it nice to have a brother come out and remind us, of all the things that need to be done right ( as we already know it) in a way that speaks through a culture of the reader and secondly reinforce success. No BS. Things we have picked up elsewhere molded in a way that is simple, clear, to the point and tasteful inspires more ambition. To the hustlers out there: Keep reading, applying and repeating this material. Excellent read! Right on time.